La fisica de los milagros ofrece un proceso de cambio facil y reproducible, orientado a resultados, que se basa en los principios fundamentales adoptados por el campo de la fisica escalar y cuantica. Este grandioso libro puede ensenarle a cualquier persona como acceder a su poder creativo para sanar y transformar vidas. 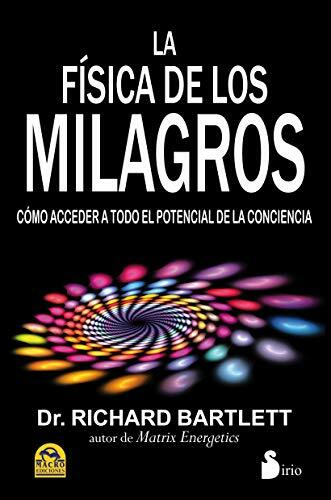 / The Physics of Miracles provides an easily-reproducible, results-oriented process of change that draws on the fundamental principles embraced by the field of quantum and scalar physics. This paradigm-busting book can teach anyone how to access their creative power to heal and transform their lives. Richard Bartlett, DC, ND, holds a degree in chiropractic and a degree in naturopathy from Bastyr University. After discovering his own extraordinary healing capabilities, Bartlett created Matrix Energetics as a system for helping others access their untapped potential. He is the author of "Matrix Energetics" and "The Matrix Energetics Experience, " and has helped thousands of people transform their lives through his national workshops and seminars.